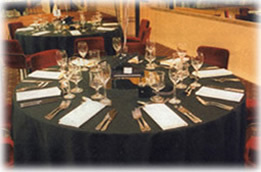 Clets Australia is a company that makes to order, that is we on a regular basis create any size, shape and style when it comes to table linen. 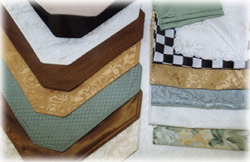 Shapes from square, rectangular, round, oval, u-cloths, serpent, cloths to touch the floor with rounded corners, any shape, as long as we have the sizes we can create it. We also offer styles such as box design cloths that can either be tied like bows on the corners (display table cloths) or stitched down each corner. 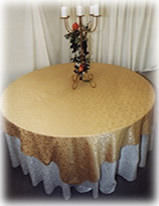 With the range of fabrics and colours I’m sure we can create table linen suitable to your needs. As with the table linen we provide, we also supply napkins, placemats and tray cloths, bar runners, table runners and even doilies! 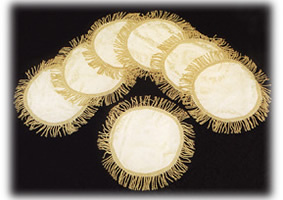 If for any reason there is a linen item that we have not named but would like to enquire if we could, please do not hesitate to contact us, as we will be more than pleased to assist with any enquiry.